Empower's Own Kirk Bausch Rages Through Idaho in the LP200! Kirk Bausch and his 3 companions, raced their way over 3 mountain passes, through freezing rain and altitudes close to 10,000 feet to compete in the LP200 from Boise to Sun Valley, Idaho last weekend. Their relay team which was comprised of 2 groups of 2 guys, raged through the course in 8 hours and change. Kirk says he needs a few days of recovery worked into his calendar after this epic adventure! This picture is Kirk waiting for his partner to transition. The Tulsa Tough is just the next challenge for the former model. Dotsie Bausch got into cycling while working in TV in California. Dotsie Bausch has found peace, focus and control in the sport of cycling. The former model spent seven years living a bit out of control fighting eating disorders along with a drug addiction. However, a move to California in the mid-1990s and a change of careers were a perfect tonic. Bausch also discovered the world of bicycle racing. The healing began in earnest. Bausch will be part of the Jazz Apple team racing in the fourth Tulsa Tough set for three days beginning Friday night in the Blue Dome District. Saturday's daytime races feature the Brady District and Sunday's finale is set along Riverside Drive and Galveston Street. Bausch is the first to take responsibility for her life. She knows her eating disorders began while an undergraduate at Villanova. Estimates say 5-7 percent of American women suffer from one of the two starving or binge eating disorders at some time during their lives, according to the Medical News Today. Bausch knows the guilt that comes with those disorders. But, she is more than healed. She gives speeches to women on getting help. "I am super open with it when I speak," Bausch said by telephone from her California home, where Jazz Apple's team spends part of the year before returning to New Zealand. "I am completely recovered and have been for quite a while. There are reasons behind everything. I try to help others navigate through the pain and disease. "There's lots of shame (connected with the disease). I try to be open and free about it." Bausch spent 1993-99 suffering while trying to finish school and work. "Everything changed when I knew I could be totally honest (about the disease)," Bausch said. "Some people go through this for 20 years. It was really bad in the middle for me and working full time as a model in New York. I don't blame the industry. It was all me." Modeling opened many doors that allowed Bausch to travel and meet great people. But, a drug addiction was part of her daily life, too. "It was all-consuming," said Bausch. "It's terrible for your system, but I was still functioning." Things started to turn around when Bausch decided to change careers. The move to California for the Louisville, Ky., native was another positive step. She got help and discovered cycling in an unusual way. Bausch moved to California to be a television production artist. Her first job was on the set of the pilot for "Dharma & Greg." When the work was done, items from the set were up for grabs such as old chairs and a mountain bike. Luckily, she changed the knobby tires on the mountain bike before the ride. Bausch decided she wanted the sleek road bike. She got a racing license and suddenly took on road racing. Bausch is considered one of the best climbers and time trial riders in the women's peloton. She has an impressive list of podium appearances under her belt, capped off by a bronze medal in the time trial at the 2007 Pan American Championships. She was a member of the U.S. National Team and won two national titles on the velodrome. Bausch admits she got into riding late at the age of 26. She helps the younger Jazz Apple members as co-captain, setting the example and helping. She credits Jazz Apple team leaders Susy and Chris Pryde for much inspiration. "Dotsie has a remarkable outlook on things and despite her busy life, she is naturally a nurturing and very open person who makes time for everyone," said Susy Pryde. "Her self-awareness and honesty also make that experience a genuine one." 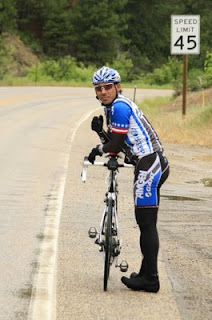 Bausch's Web site (tulsaworld.com/empower) is dedicated to building better riders. She summed up eating disorders. "Bulimia and anorexia still remain somewhat taboo (subjects). It doesn't make sense to people. People understand overeating, but it goes the other way, too. Restraining from eating." The day Bausch was interviewed, she received an e-mail from a Canadian woman who had been battling eating disorders. Bausch knew the woman and how she almost died. "This was her five-year anniversary," said Bausch, who will sign autographs with her Jazz Apple teammates at Tulsa's Whole Foods Market at 3:45 p.m. Sunday. "And she is completely healed. Even if she was the only one that I've helped that would be enough. It was so cool for that e-mail to come through today. That was worth it."